This classic sticky-sweet potato meal kit cooks slowly on the stove in an apple-cider vinegar syrup. Adapted from the Savor the South cookbook series. 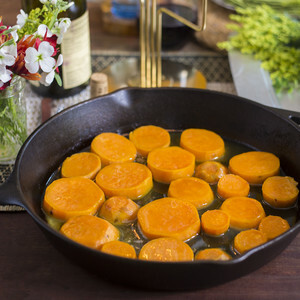 These classic sticky-sweet potatoes cook slowly in a syrup that gets its flavor from the sweet potatoes and a splash of apple cider vinegar. Adapted from a recipe in “Sweet Potatoes” by April McGreger, part of UNC Press’ Savor the South cookbook series.